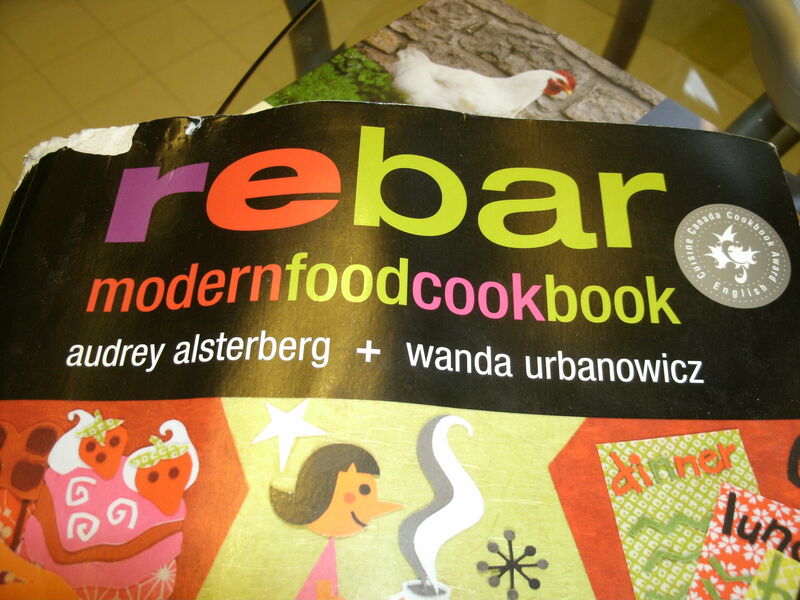 It is not that often that my good man attempts anything in the kitchen, but recently I had to go looking for my tattered, well-used copy of the Rebar Modern Food Cookbook, and he added items to the grocery list this week (also out of the ordinary), fresh rosemary, yeast and a few other things made me to believe something was in store. I was right. 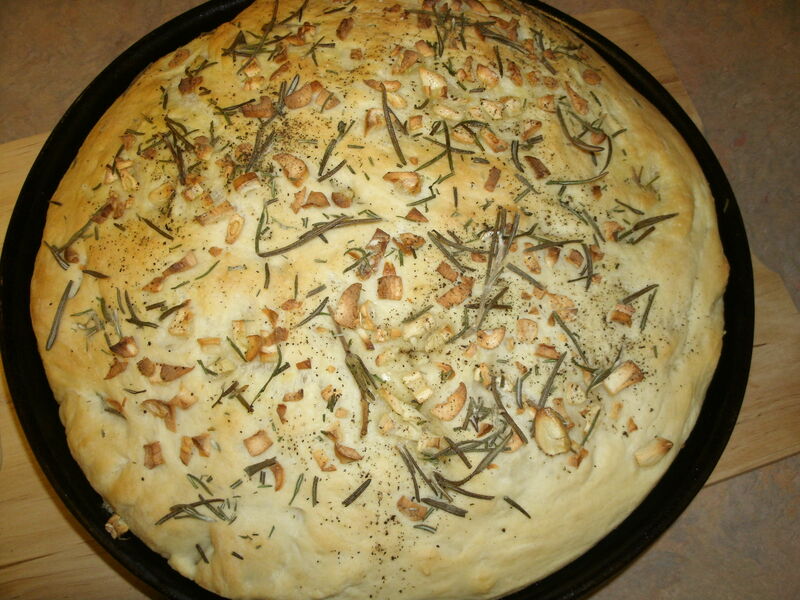 He made Rosemary Garlic Foccacia from the Rebar cookbook, it was a delight to watch and our house smelled fabulous! The whole process from start to finish was fun. I am sure me hovering over was not exactly what he had planned, but watching him put this together, waiting for the bread to rise, the resulting perfectly shaped delicious result was really wonderful for this first time bread-maker. 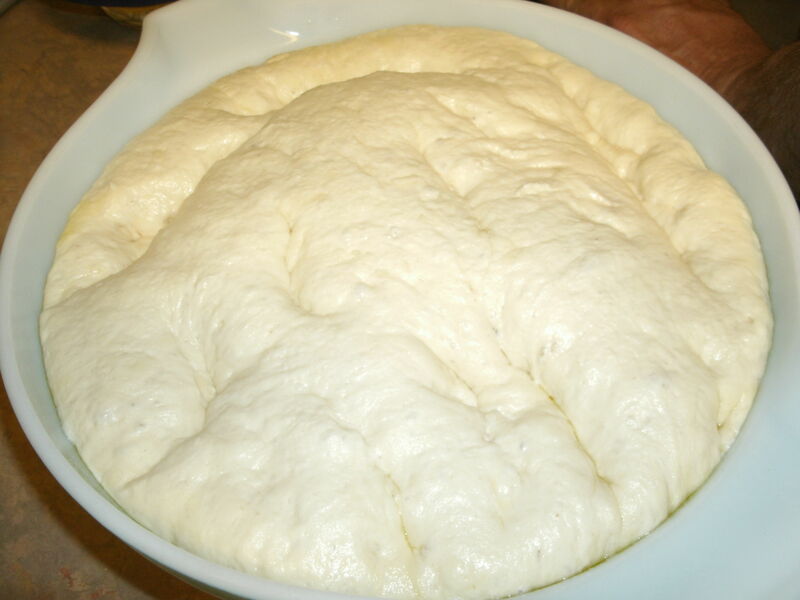 In a large mixing bowl, combine the warm water, yeast and sugar. Let the mixture sit until it foams. Stir in salt and olive oil, then start adding flour, one cup at a time, beating well with a wooden spoon. When you can no longer stir, turn the dough out on a floured surface and knead in the remaining flour. Knead the dough until smooth and elastic, sprinkling just enough flour on the counter to prevent sticking. Form the dough into a ball and place a large, lightly oiled bowl. Cover with a clean, damp cloth and set the bowl in a warm, draft-free spot. Let rise until doubled in bulk (1 – 1 1/2 hours). Punch the dough down and let it rise again until doubled. Pre-heat the oven to 350F. 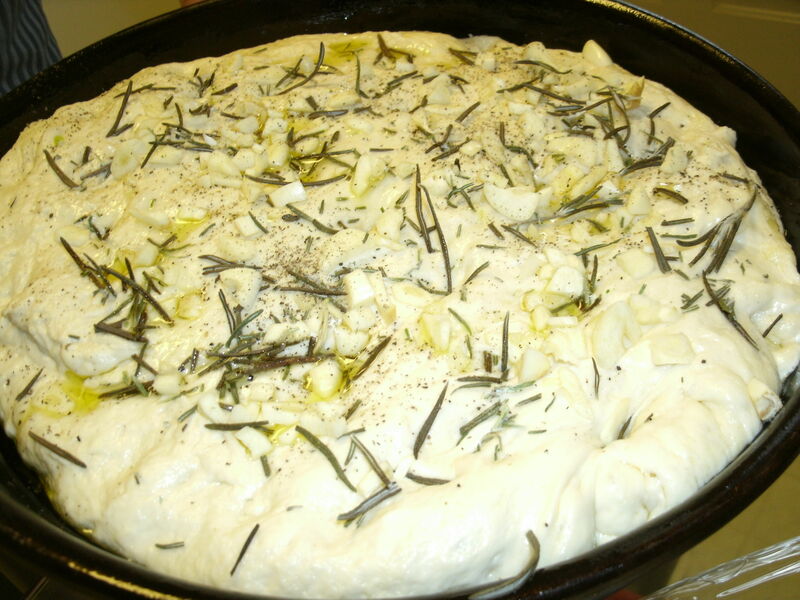 Place the dough on a well-oiled 12″x16″ baking sheet with 1/2″ sides (he actually used a round Pampered Chef stone with a lip). Gently stretch the dough to roughly fit the dimensions of the pan. Drizzle the surface with olive oil and spread the minced garlic over the entire area. Sprinkle chopped rosemary evenly on top, followed by coarse salt. Finish with cracked pepper. Using your fingertips, gently poke indentations over the entire surface. It should appear dimpled and rustic-looking. Let rise again for about 15 minutes. Place the loaf in the center rack of the oven. Bake for 20 minutes, rotating the pan halfway through. The garlic should be lightly golden. Be careful not to over bake. I hear him in the kitchen now, he is starting a pasta sauce from scratch, I better get down there. Ciao!